• The Bulls will conclude their two-game road trip on Monday night with a tough road battle at Southern Illinois. Both the Bulls and Salukis played nationally ranked competition on Friday night with Buffalo taking down #13 West Virginia, while SIU had both first and second half leads at #2 Kentucky. This is the first all-time meeting between these schools, but they will see each other once again on Dec. 15 when SIU comes to Alumni Area. • UB senior CJ Massinburg became just the eighth player in college basketball, dating back to the 2010-11 season, to record at least 40 points and 14 rebounds in a game. He is only the third one to do it on the road, and the first to do it against a nationally-ranked opponent. • Dating back to the 2010-11 season, no opponent has scored more points against West Virginia then Buffalo did on Friday night with their 99 points. The only other opponents who have scored over 90 points against WVU over the last nine seasons are Iowa State (93), Kansas (91), and Villanova (90). • Monday night's game is a homecoming for Director of Basketball Operations Adam Bauman, who is a 2009 graduate of Southern Illinois. He served as a team manager and during his time in Carbondale, the Salukis garnered bids to three NCAA Tournaments and one NIT. He was a part of the 2007 SIU squad that advanced to the Sweet 16. • Southern Illinois opened up their season second-ranked Kentucky on Friday night and held their own against the Wildcats, holding leads over Big Blue in both the first and second halves before Kentucky came away with the 71-59 win. Aaron Cook led the way for Southern Illinois with 18 points, while Kavion Pippen added 16 points for the Salukis. • Southern Illinois went 20-13 on the season last year and 11-7 in the Missouri Valley Conference before falling in overtime in the conference tournament to Illinois State. The Saluki defense allowed under 70 points a game last year, forcing their opponents into 13.5 turnovers per game. They return their top four scorers from last season, all four averaging 9.8 points per game or better. • The Salukis were picked to finish in third place in the preseason poll for the Missouri Valley Conference behind Loyola Chicago and Illinois State. Southern Illinois received four first place votes in the preseason MVC Poll. • With 15 seasons as the head coach at two Missouri Valley Conference schools (Missouri State and Southern Illinois), Barry Hinson is the Dean of the MVC and ranks fourth all-time in overall wins (268) and MVC wins (145). The Salukis have posted three-straight winning seasons under Hinson, including a 20-13 mark in 2018. Picked to finish fifth, the team placed second with an 11-7 league record. In 2016, SIU achieved a 22-10 record, a season in which Hinson was named the MVC Coach of the Year. Hinson was named the school's basketball head coach during a press conference on March 28, 2012. He became just the 13th head coach in the 99-year history of the program. Hinson served four years on Bill Self's staff at the University of Kansas from 2008-12. Hinson spent eight years as a high school coach in Oklahoma before landing a college job on Self's staff at Oral Roberts in 1993. The Bulls face the Southern Illinois Salukis on Monday night, looking for their first 3-0 start to a season since 1986-87. The Bulls are coming off a 99-94 overtime victory at 13th ranked West Virgina on Friday night, overcoming a double figure deficit with under five minutes remaining. 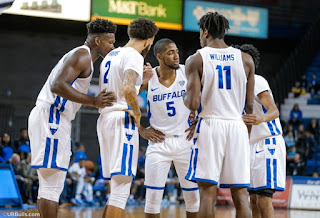 While Buffalo and Southern Illinois have never met, UB is 6-8 all-time against schools currently in the Missouri Valley Conference, including three of those wins coming against Evansville. Southern Illinois is looking for their first win of the season following a 71-59 loss at Kentucky. Monday night is the first of three straight home games for Southern Illinois, who will play Arkansas-Pine Bluff on Saturday and Howard next Monday. Senior CJ Massinburg had a career night on Friday in the win at nationally-ranked West Virgina as he scored 43 points and 14 rebounds. His 43 points are the second highest total by a player in the nation this year, only behind the 44 points scored by Chris Clemons of Campbell. The career performance helps move him even closer to becoming UB's all-time leading scorer. Massinburg currently has 1,408 career points, which is seventh in school history and he is just six points shy of passing Turner Battle(2001-05) for sixth place. With a strong senior season, Massinburg could surpass the 2,000-point mark and become Buffalo's all-time leading scorer. Massinburg had 1,354 points, 542 rebounds and 214 assists though three seasons. He one of just four players nationally with at least 1,300 career points, 500 career rebounds, and 200 career assists joining Ethan Happ (Wisconsin), John Konchar (Fort Wayne), and Quinndary Weatherspoon (Mississippi State). Massinburg played in the fewest amount of games of that group at 95. The Bulls are coming off one of their best wins in school history as they defeated West Virginia on Friday night, 99-94, in overtime. It was UB's first ever road win over a team in the top 25 as the Mountaineers entered the game ranked 13th. Over the last four years, Buffalo is the only non-Big 12 team to come into Morgantown and leave with a win over West Virginia while they have been ranked in the Top 25. Dating back to 2011-12, the only other unranked non-conference opponent to go into Morgantown and leave with a win while West Virginia was ranked was LSU as they came away with a 74-73 win on Dec. 4, 2014. Buffalo continued right where it left off in the season opener, scoring 82 points in the win over St. Francis and 99 points against West Virginia, the 56th time in 105 games as UB head coach that a Nate Oats teams has scored 80 or more points. The Bulls are 48-8 in those games when scoring at least 80 points. Senior Nick Perkins begins his senior season 14th on UB's all-time scoring list with 1,271 points, just nine shy of Rick Coleman (1987-91) for 13th place. Perkins was named first-team All-MAC last season and he was named the MAC's Sixth Man of the Year for the second straight season. Perkins scored in double figures in 25 straight games last year after returning to the bench. Over the previous two years, Perkins has scored 20 points or more nine times as a reserve, the sixth highest totally nationally. Graves is averaging 13.0 points per game through the first two contests, including scoring 14 points in the win over West Virginia, including a few monster dunks right over the Big 12 caliber foes. Williams has been listed by Rivals.com as the 83rd best recruit in the country and ESPN.com listed him as the sixth best player in the state of New York. Williams had seven points, five rebounds, and two blocked shots in his collegiate debut against St. Francis. One of the other highly-touted newcomers on this year's team is freshman Ronaldo "Rondo" Segu. A native of Orlando, FL, Segu won a 3A State Title his senior season with Orlando Christian Prep, scoring 11 points in the title game. Segu played his prep ball with current North Carolina freshman Nassir Little, who many have pegged as a possible #1 overall NBA draft pick next season. Segu was listed as the 44th best point guard in the nation by Rivals.com this past season. He is a social media star, that has over 108,000 followers on Instagram.